I made noises last year, as did a friend of mine, about attending this coming meeting though unfortunately due to a myriad of reasons it’s not looking likely for me… however with things going as they are with RR (only up! ), I’m hoping I’ll be able to make the 2010 event instead. There is still a slight chance of making ’09 for me but I’m not going to hold my breath. The day was beyond beautiful, the sky was fantastically blue, the only detriment to this of course was that the track (an airport runway) and the air temperature for optimum performance, suffered slightly. With that said though, Matt did manage a 13.5 in his first event on the drag strip. Which I thought was most definitely worth the 2.5 hour drive from Invercargill. To those unaware, Teretonga is Invercargill’s race track. 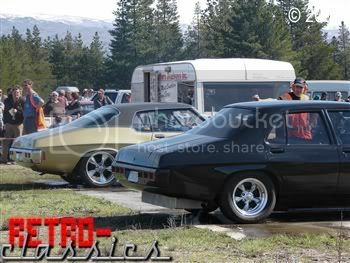 Every year around the middle and tail end of February, the “Southern Festival of Speed” (a series that has events in Christchurch (Ruapuna), Timaru (Levels), Dunedin (Street Race) and as mentioned, Invercargill (Teretonga)) rolls into town. 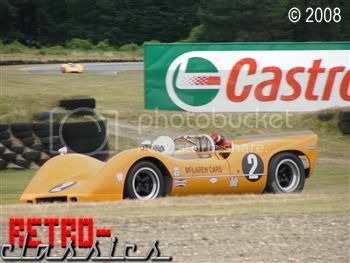 Cars come from all over the globe, the most recent one saw Can-Am cars (amongst others) take to the course, which was a very welcome spectacle to those who were used to much quieter modern machinery and your more typical Formula Ford affairs.